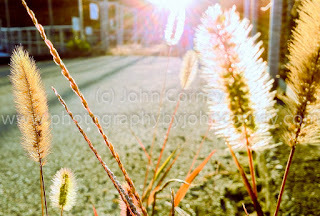 This is a great example of backlit photography, with the sunlight coming through seedheads. It demonstrates the kind of effects you can get if you keep your eyes open and focus low. The months around late fall to early spring are the best times of year to capture these kinds of shots because the sun is so low in the sky, or soon after sunrise or soon before sunset. I took this photo photo while walking a country road in rural Kofu Prefecture, Japan as the sun was getting close to setting in mid-October 2015. The photo was taken with my Samsung Note 3 cell phone.